Take control of some amazing police cars (speed car, SUV, and 4x4) in a huge driving environment ready to explore, with a big city, forests, canyons, hills and mountains: more than 16 km² of area and 30 km of roads! !! 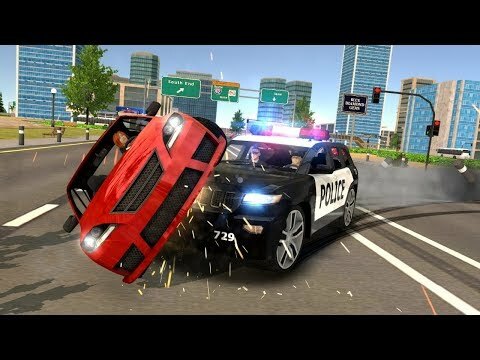 Police Car Chase - Cop Simulator contains unlimited free levels !! It is the latest and one of the best police car simulators! Drive in a whole city with realistic and intense traffic, and try 8 tracks to pull off super high speed. Complete tons of missions to become a professional driver and a good cop! The road systems are also very dense, from highways and 2x2 lanes to very small road of mountains, with hill climb terrain to drive over. This game offers the massive open world for the best car driving simulator game experience! Race, drift, crash, jump, and flip around a huge detailed open city, perform tricks and stunts, and have fun! The most realistic and extreme car driving game you'll ever experience, Police Car Chase - Cop Simulator!